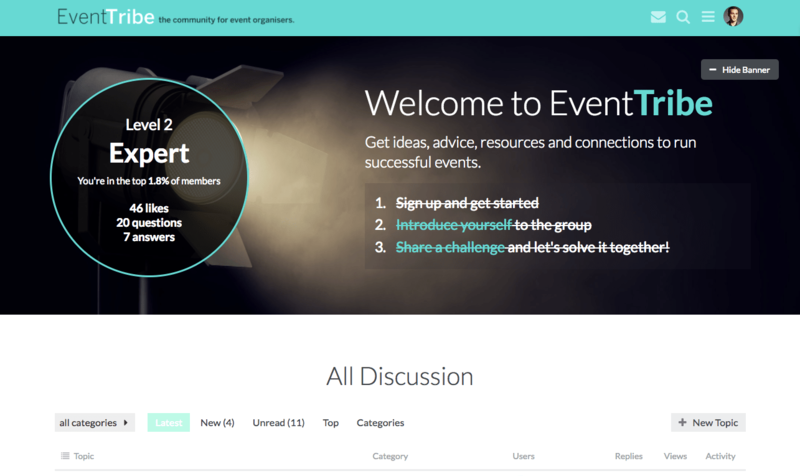 Last summer, we were hired by Eventbrite to work on their EventTribe community. 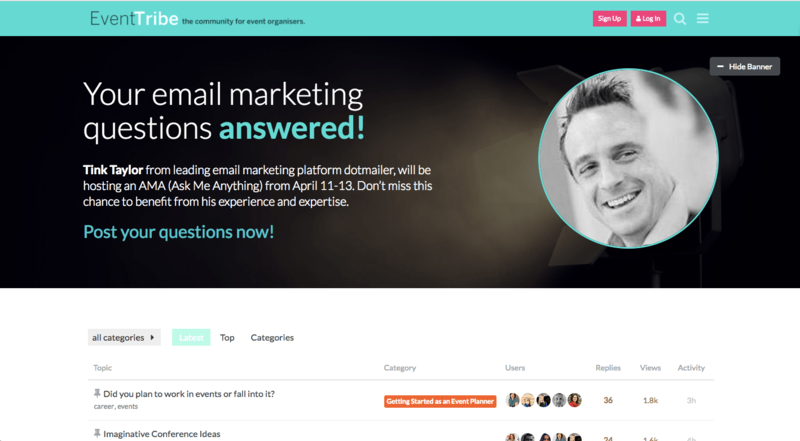 EventTribe is a really interesting customer acquisition community. The primary goal is to gather leads of significant value through the community. This meant the concept had to be about the topic (running successful events) and not about the product (the latter would only attract existing customers). In this post, I want to share the process we went through. (You can see the results for yourself here: www.eventtribe.com). EventTribe was an inception-stage community, our goal was to drive it to establishment and, eventually, maturity. This meant increasing the number of quality leads generated from the community while putting the site on the path to sustained growth. To get started, we undertook three types of research, interviews, surveys, and analysis of community data. 1) Interviews with key stakeholders. The first step was to interview the key stakeholders. This is especially important to establish the value. For example, what qualifies as a lead? Is lead-scoring used? What is the process for passing a lead from the community to the sales team/process? Who are the best types of leads etc? These interviews also identified any areas of uncertainty among staff and the kind of training which would suit them best. This helped us focus our efforts in a few key areas. 2) Interviews with community members. We interviewed a range of community members and highlighted every possible useful point in the transcript. This revealed a range of challenges members faced, how they thought about the community at the moment (‘interesting, but many discussions weren’t relevant’), and opportunities the members might want to pursue. We dropped most of these ideas into the surveys (below) to validate it among the broader community. 3) Survey of the community. Click here to see the exact questions. 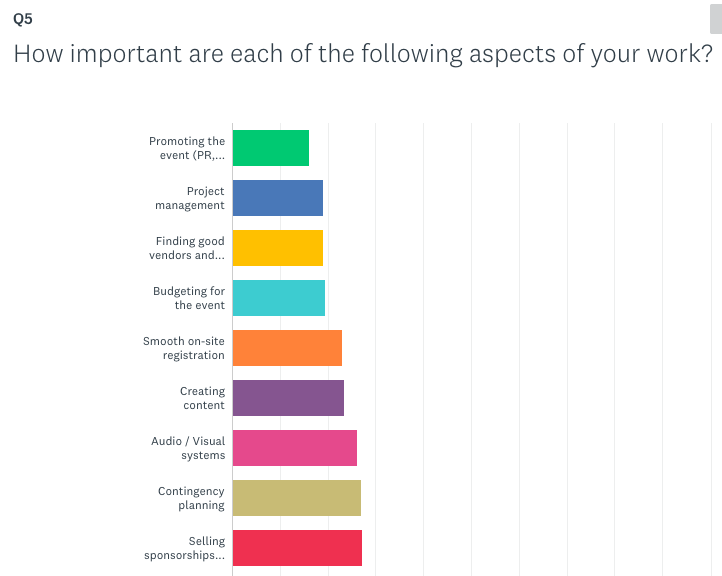 We wanted to know who the active audience were, what type of events they ran, what topics most interested them, and what they wanted to see next. One of the key questions here is to let members rank which types of content they want to see and how they want to see it. The results broadly showed we had a big audience who run events for 101 to 500 members and want to learn event promotion, project management, and finding good vendors/venues. They also wanted this as quick tips, detailed guides, and interviews/AMA formats. The survey also revealed some other interesting challenges and information we would use later. 4) Analysis of the community data. 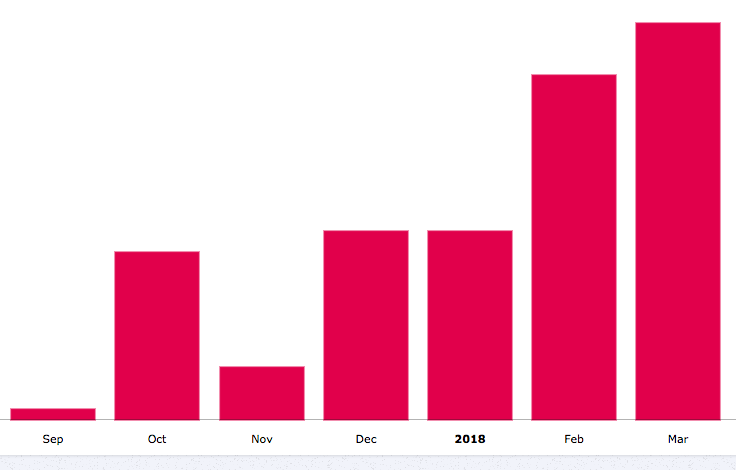 The community data showed an increase in traffic (especially due to some paid social advertising), but a decrease in the number of members who were participating each month. We identified the exact areas where members were dropping out and the key challenge, relevancy. Once the research was complete, we could begin making laser-focused interventions to improve the metrics we wanted to move. The first challenge was to improve the newcomer to regular conversion ratio. This began by mapping out the current process. We reviewed every community touch point and developed broad recommendations to optimize each point. Then we prioritized them and decided which we had the resources to pursue. (Aside, it’s often staggering how effective most of these ideas are, yet so few people talk about them). Once complete, we pursued the process systematically. 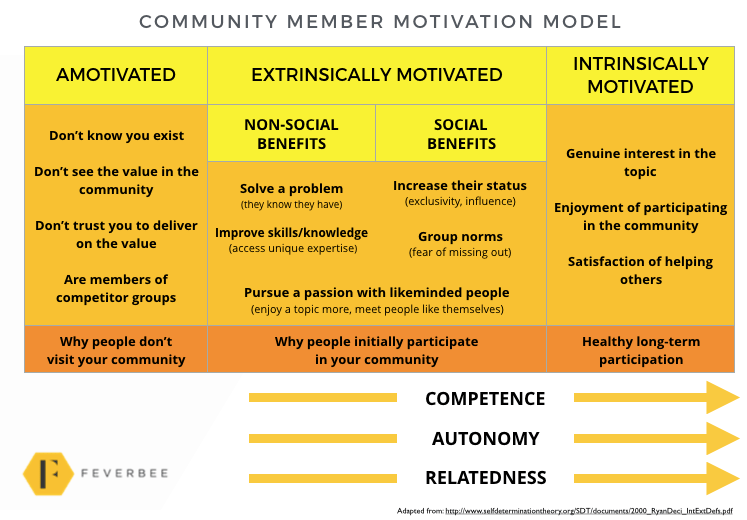 Remember the motivation model below? Establishment-phase communities need to ramp up their awareness. This has to be done within the very structure of the community. This began by looking at where members came from today and doubling down on the most successful channels. The data quite conclusively showed the Eventbrite site was the biggest driver of traffic (especially the blog). 1) Inserting community-related messages in blog posts. This meant going through many of the old, but frequently visited, content published and adding simple links to the community. 2) Adding pop-up notifications during community webinars with top experts. These are very effective to drive traffic from a popular blog to a community and sourcing good questions. 3) Getting better at mentioning and promoting community activities on the blog in general. Going forward, we would collaborate better with the writers of the blog to mention and feature community activities where relevant. 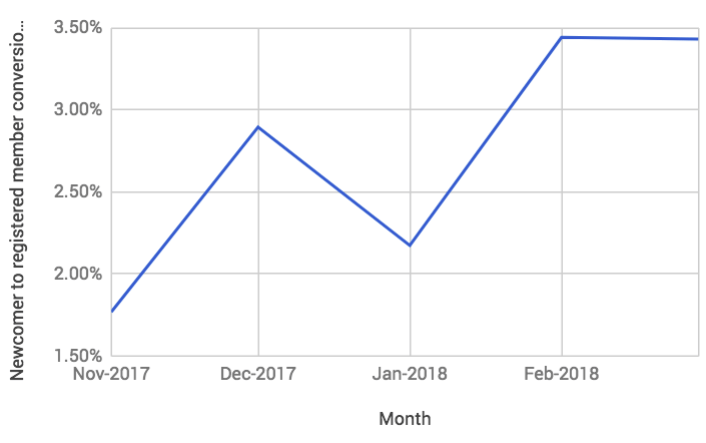 As a result, traffic from the blog increased steadily and exploded with a monthly increase, so far, of nearly 230% (shown below). 1) Shortening the title/banner of the community on Discourse. The current title tag and meta-description were too long, so we shortened this. 2) Reducing the size and content of the title of popular topic discussions. Same as the above, we had long category names which hurt our search traffic. So we reduced the size of the category titles. 3) Creating discussions around topics most likely to drive traffic (this included venues/vendors, AV needs etc…). Very specific topics (e.g. top event venues in London) seemed to be very popular for search (albeit less good for discussions). 4) Merging related discussions together. This is still a work in progress but will become increasingly important going forward. 5) Adding better meta-descriptions and copy to the category pages (e.g. the event planning page). Like most communities, EventTribe had category pages which were devoid of almost all SEO-optimized content. 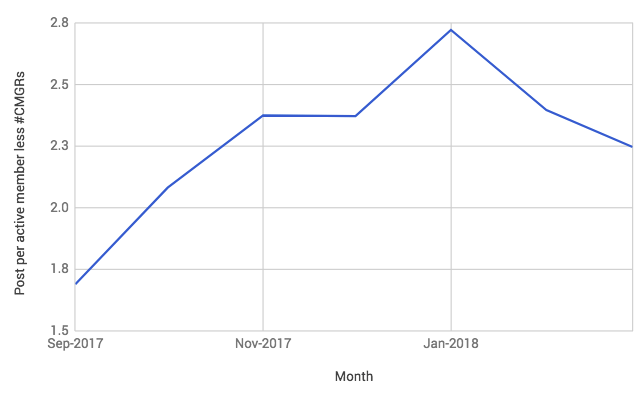 These changes (almost certainly combined with the natural growth in long-tail search terms) increased traffic by around 37% (excluding Christmas period). We also tried to build good relationships with partners and drive referral traffic. This proved to be a colossal failure. Generally speaking, partners weren’t as invested or interested in the community as we were. However, overall the results were extremely positive. Traffic to the community has risen by 50% since September. 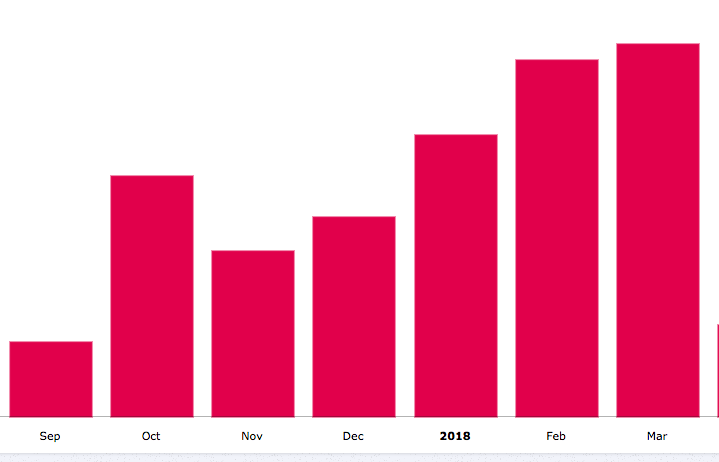 It’s definitely possible to increase this, but with limited resources we also need to ensure we can convert this traffic into engaged members of the community. This is where the real challenge begins. Most communities, with some glaring exceptions in specific categories, have conversion (sign-up) rates that hover from 0.1% to 2%. By the time we had begun working on the visitor to registered members ratio, it had dropped to 1.77% (this often happens when you drive more traffic, the registration ratio declines). The background image was slightly jarring, the message was bland and contrasted badly with the background, and the sign up button was hidden in the top right corner. The banner suffered from the same problem as most banners. It was dull, impossible to hide, and showed the same message to every member regardless of how engaged the member had been. It was wasting the most valuable real-estate in the community. Fortunately, because the community was on Discourse, we could revamp this to almost anything we want. We used some conditional logic rules to design a banner which had a clear call to action for new members. We also added a clear reason to join the community (i.e. what people get by joining). This came directly from the interviews we had undertaken. This not only guided people to participate, but also highlighted the exact first steps we needed them to take. The ‘hide banner’ option in the top left was a useful touch for regular members. We also worked harder to ensure fresh, engaging, discussions appeared at the top of the community. This meant people would genuinely want to join and participate in the discussion. The community is best for the ‘editors picks’ type of filter. This was easy enough to do and was great for testing different things to see what people participated in. These small tweaks doubled the number of visitors who registered to join the community from 1.77% to 3.43%. These might sound like small figures, but consider this ensures our awareness efforts are now twice as effective. It means thousands of new members every year. You can beat this if your community is brand new, by using pop-ups, and dangling incentives (e.g. sign up to get this free report), but we didn’t want to go down this path for various reasons. Step 3: Increasing the number of registrants who participate. The messaging on the conditional logic banners didn’t just ask members to sign-up and get started, it also guided them to introduce themselves to the community and ask their first question. As they complete each task, a ‘strikethrough’ would appear (we might replace these with ticks soon) so they could follow the journey. If they completed all three, they would be moved to the ‘second banner’ where they would get a different set of tasks to complete (more on that in a second). (note, it looks a lot bigger on this graph as community-analytics base-rate is set to the minimum value instead of zero). I suspect it would be very difficult to increase these conversion metrics any higher. Beyond 30% there tends to be a law of diminishing returns. Step 4: Increasing the number of registrants who participate. The next step was to increase the number of members who participated overall (i.e. get members to stick around and participate more). This required some content programming, direct engagement via @mention groups, more conditional logic tweaks, improving @mentions too. From the survey we identified the key topics members wanted to learn about and found experts who wanted to talk about them. Some of these proved more successful than others, however, they also spiked the traffic. We even designed a custom banner for each person where we can quickly tweak the wording/photo for each new expert. It would be interesting to test having multiple panelists to discuss topics over the course of a week. We tend to run sessions once a month, but these can last longer. Thus far they have been successful, but there is plenty of scope to improve these. We’re still testing ideas. An often cited problem was the relevance of the content. There is a huge difference between people working on a global festival and those hosting a look bookclub meetup. We needed to increase the relevancy of content. Discourse allows you to drop people into groups and @mention the entire group at once. Most people aren’t using these features at all. The Eventbrite community allows people to add the events they’re most interested in on their profiles. 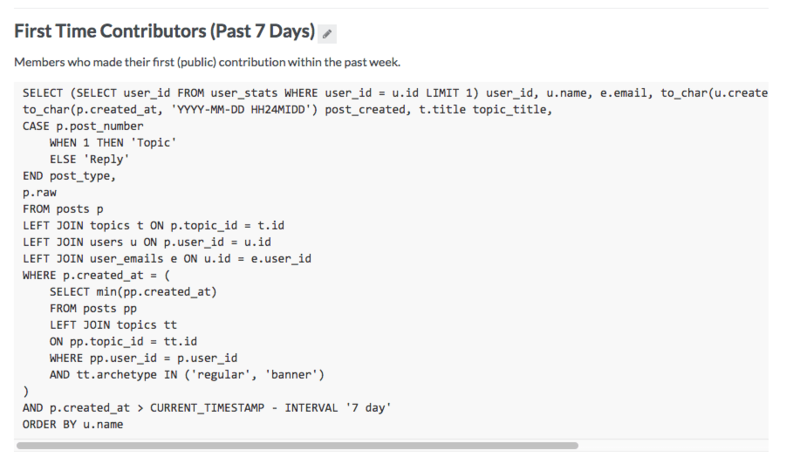 We created a SQL query using the data explorer plugin on Discourse to list all members (and then all new members) by event type and then use the ‘bulk add to group feature’ to drop them each into unique groups. We now have almost 30 groups separated by biggest interest. We’ve only just begun testing this, but I suspect it will prove quite effective at @mentioning small groups of people into relevant discussions (you can also use this for all newcomers). New registrations previous 7 days. Members who were active 2 months ago but not the past month (i.e. people drifting away). Members who have joined but not participated. These queries aren’t too complicated to create (or find someone to create) (see below) and they help the community manager build quick lists of people to reach out to with a specific message at a specific time. Another innovation we tried (we try new ideas on almost all client projects) was adding a badge to the banner below. This helped members see how they compared with other members and where they ranked overall based upon their user levels. (note these all link to discussions/activities). – Sign up and get started. – Introduce yourself to the group. – Share a challenge and let’s solve it together! – Share your best event promotion tip. – Tell us what resources would help you run your events? – What’s the best event venue you’ve used? – Suggest a potential AMA speaker/interviewee for us. – Become a community volunteer. This is in addition to the temporary webinar banner we add to the community. All these banners are implemented with some custom CSS in the Discourse themes. The results have proven fairly positive. The number of questions asked by members has increased by around 35% (with some variation over Christmas/Easter). 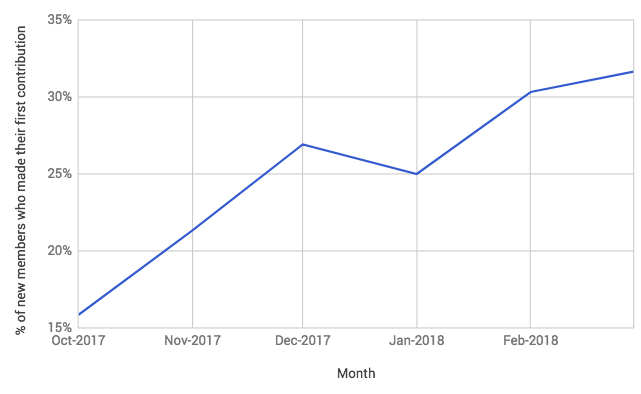 Perhaps the ultimate metric of any community’s success has been the ongoing increase in posting members as seen below. Thus far it’s risen by almost 160%. There are still a lot more things we can do here. It’s still a fledgling community with a relatively small target audience (event professionals in the UK). We haven’t yet done enough with gamification, a top contributor program, community volunteers, and lead qualification, but it shows how much you can achieve without any of these things. 1) You can achieve major increases without major platform changes. As we’ve tried to show here, you can achieve sustainably great results simply by making a few small tweaks in the right places without investing a fortune in a new technology. 2) Invest a lot of time to understand members. The interviews, survey data, analysis of community data take a lot of time to undertake, but they reveal almost everything you need to optimize engagement. Set aside 4 to 6 weeks just for this phase. 3) Law of diminishing returns. It’s not about trying to optimize everything to the max, it’s about investing your limited resources to achieve the best results. Beyond a certain level, it’s not worth the time to spend more time trying to optimize things. Focus on things which have the biggest, long-term, impact upon the majority of community members. 4) Beware of external events skewing your stats. 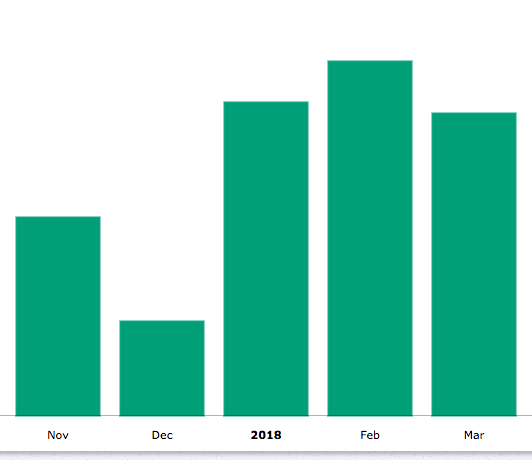 Try to use a three-month average as disruptions such as Christmas, Easter, and February’s shorter month can play havoc with the stats. 5) Some things aren’t worth quantifying. These are plenty of things above we’re fairly sure are working, but we aren’t sure how best to quantify them. Some things take a longer period of time to have an impact. We also added the terrific community team to our training courses and tried to be better in how/what discussions we responded to within the community. 6) Learn quickly from your hits and misses. Not every discussion or activity is a hit and many are outright misses. Over time we test new ideas and get a sense of what it / isn’t working. Don’t keep pursuing a tactic which clearly isn’t working. Over the years, we’ve become increasingly confident at following a process to increase participation and outputs in almost any community. The process begins with getting a full picture of the community data and then making laser-focused interventions over a period of time. There is some technical work involved, but nowhere near as much as you might imagine. The majority of the work is understanding members in an unbiased and empathetic way. This is harder than you might imagine. None of the above took a prohibitively long amount of time, cost a huge amount of money, or was technically impossible to implement. I really hope you can borrow a lot of these ideas in your own community. p.s. 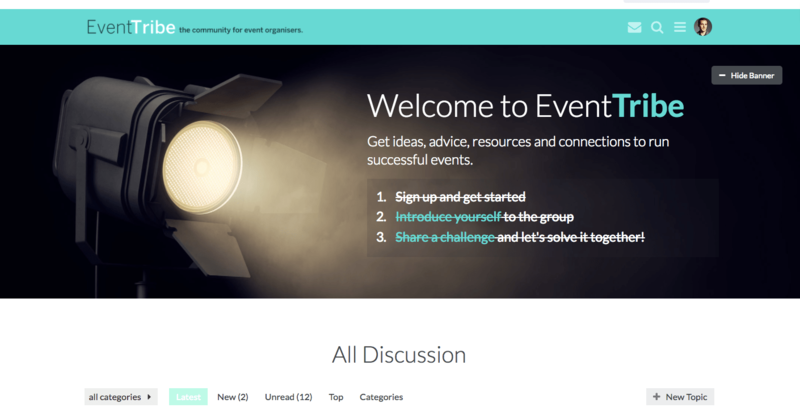 if you’re running any sort of events, I strongly recommend you join EventTribe. Hi Richard, who designed the conditional logic banners for you? Fantastic story! I think it was @pat.scullion, if I’m not wrong. Btw, great article, Rich! Super detailed. You’re not wrong. I designed and developed those using the Discourse API/AJAX search queries. An interesting project! Yes it was all @pat.scullion on this one.